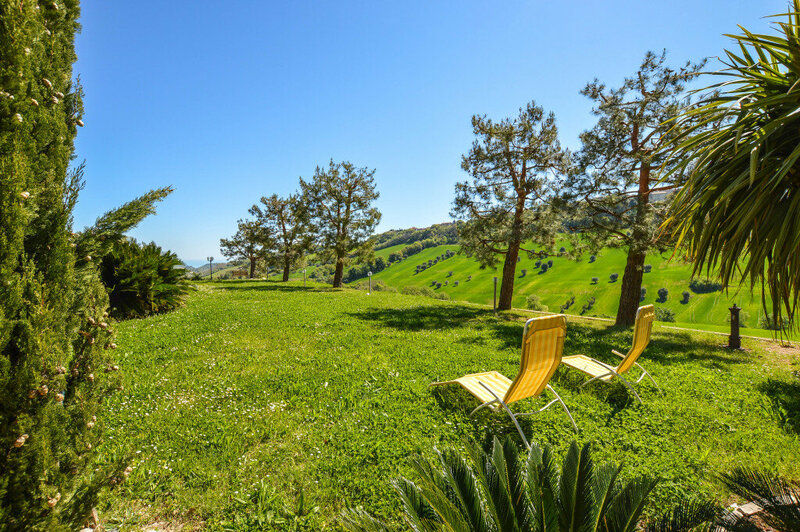 Sitting on a bench, sipping a good local wine while reading a good book, or just admiring the show of a natural valley sloping down to the sea, is what awaits you by purchasing this beautiful farmhouse near Lapedona, Le Marche. 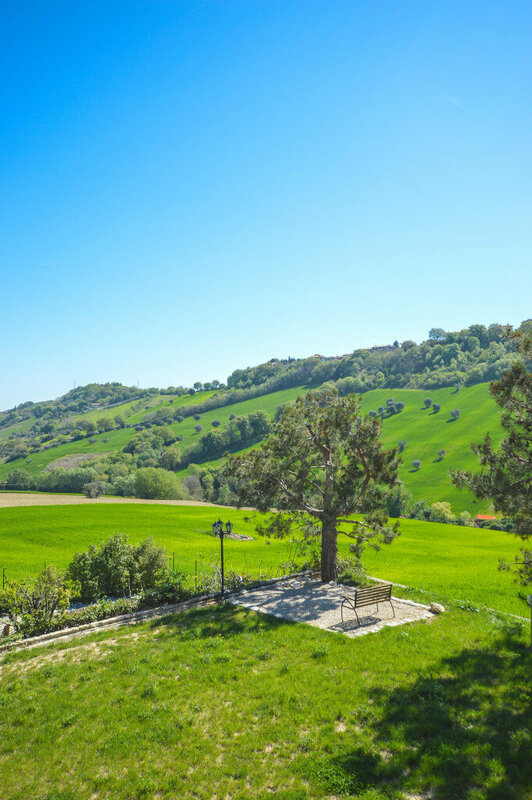 Sitting on a slope in southern Marche, just 2 km from the center of Lapedona and about 10 minutes from the beaches of the Adriatic Sea, this farmhouse is surrounded by a plot of land of about 2400 sqm. 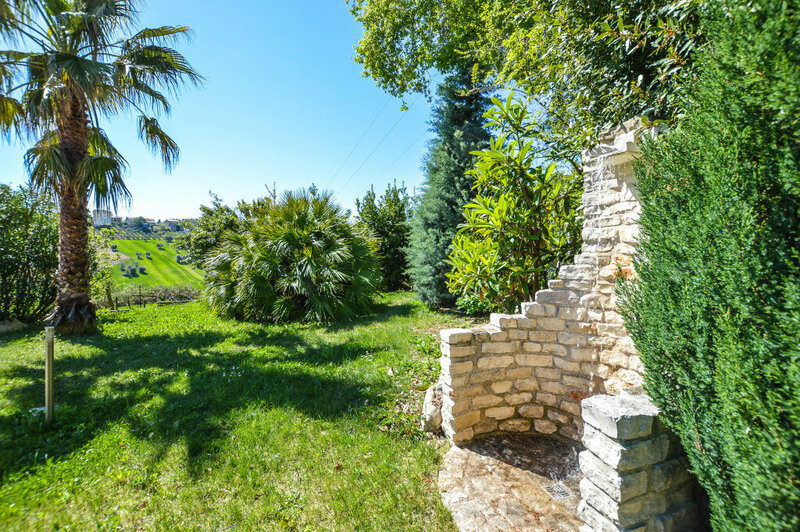 Although not too big, the garden has been expertly structured in well defined areas: from the iron gate, you can park your car in the parking area; from here you can walk down a series of small steps and terraces to a lower level where you can make a small vegetable garden and where there are some fruit trees for family consumption. 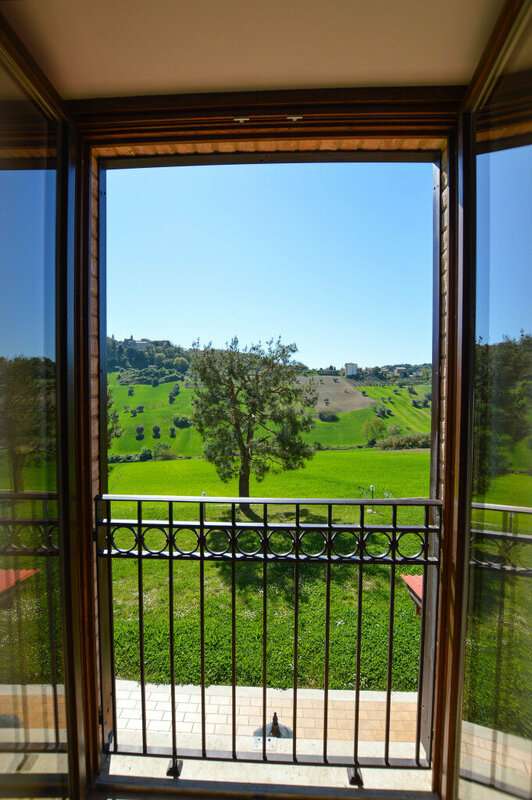 Leaving this area, you go back to the main terracing where the outdoor life of this property takes place. 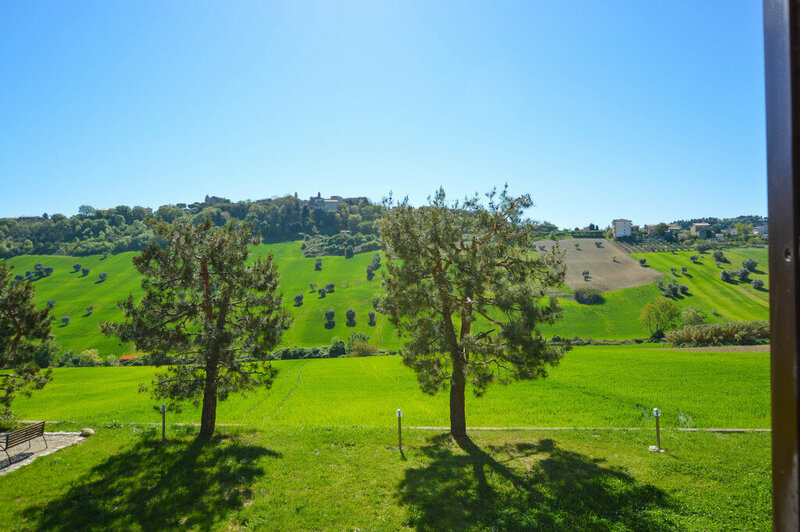 The East and South facades are surrounded by a well-groomed garden, with a beautiful green meadow. 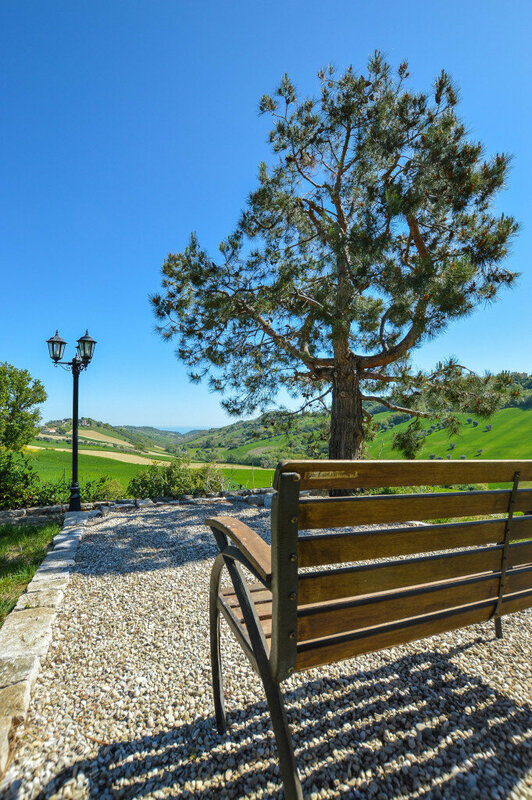 On the southwest corner of the garden, overlooking the whole valley, a pretty bench is positioned to remember that, with such a beautiful landscape, during the day you have to find time to stop, sit, contemplate the beauty of the place and take some time for yourself to relax. 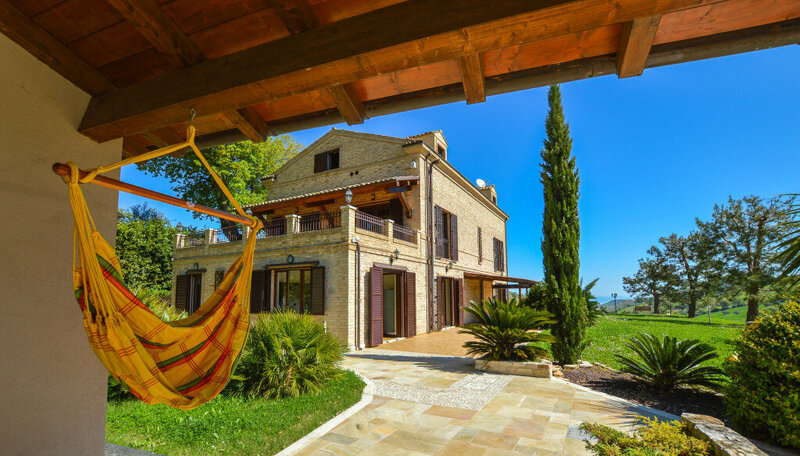 This part of the garden is in close contact with the entire living area on the ground floor: in fact, there are large french-windows and wooden pergolas to let you live as much as possible the beauty of the outside spaces. 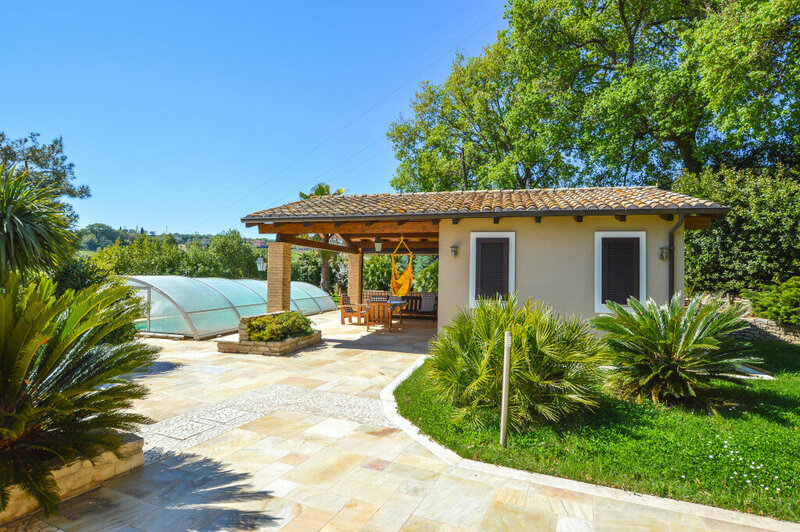 Last but not least, there’s the pool area and the outbuilding with its large 25 sq.m. 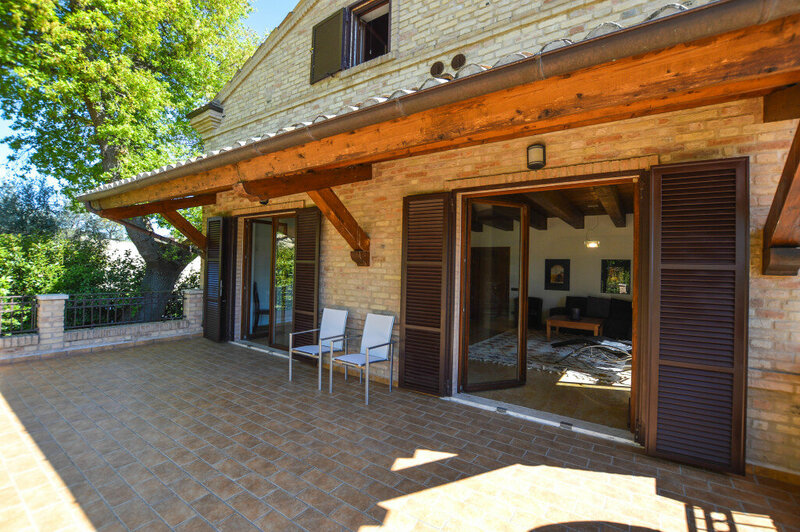 wooden porch. 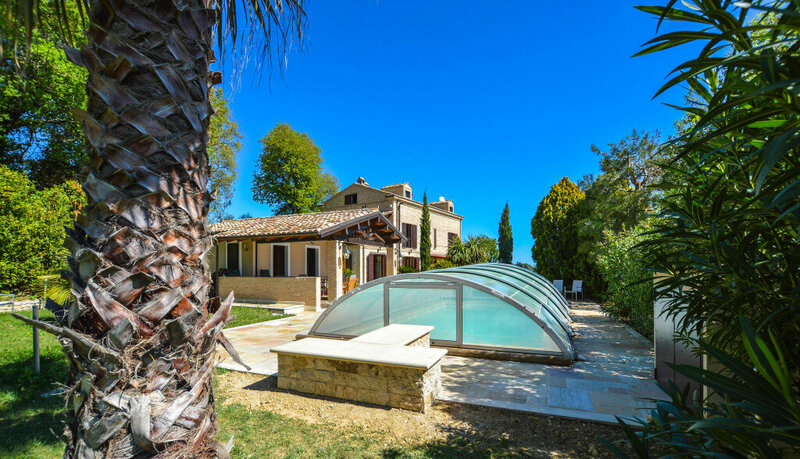 The area is predominantly paved to surround the 8mx4m pool accessible through Roman steps. 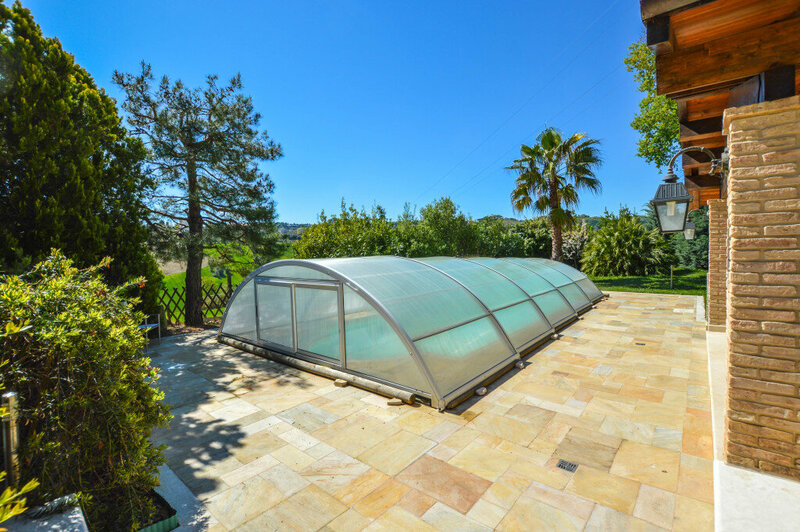 The pool can be completely closed thanks to a telescopic cover that allows you to use it also in the mid-seasons, as early May and / or end of September, when the air is still a bit cool. 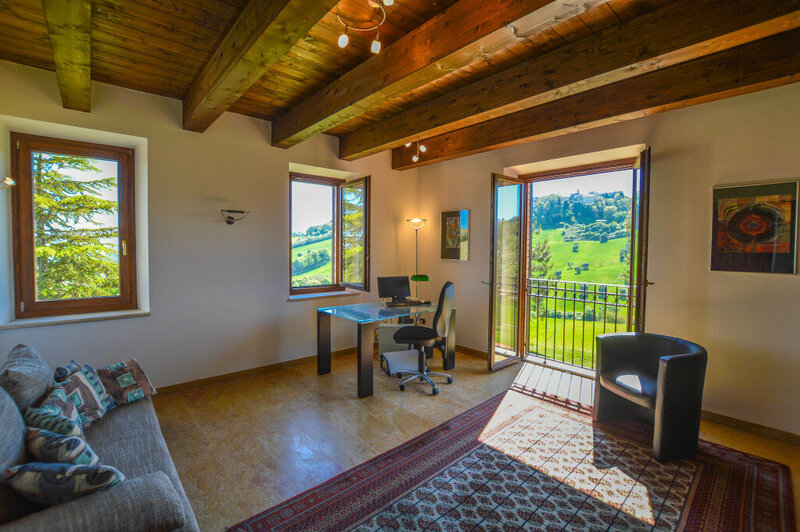 The annex, built ex-novo in respect of the surrounding countryside, enjoys a basement consisting of 3 warehouse spaces of about 50 square meters fully paved, provided with energy and with good lighting coming from the big basement windows. 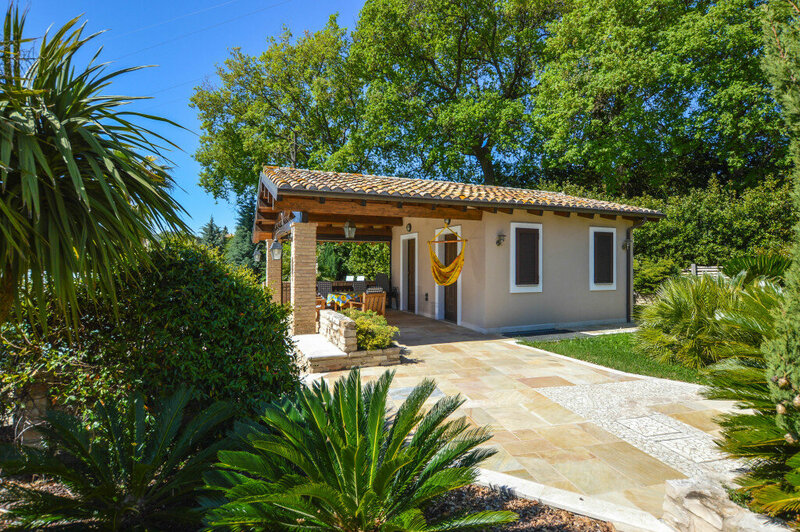 On the ground floor of about 25sqm, the annex is divided into two separate areas: one is used as a storage for the gardening and pool tools, while in the other one a small kitchen and a bathroom with shower have been built. 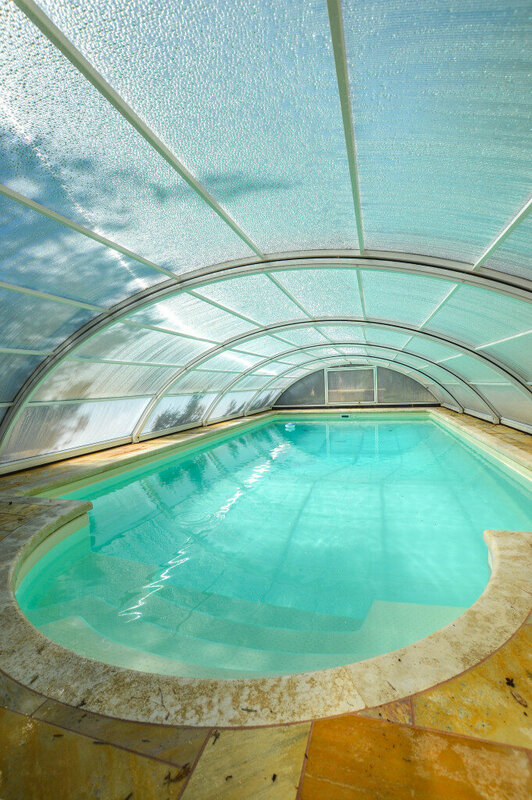 These two rooms are definitely very comfortable when you are in the pool area. 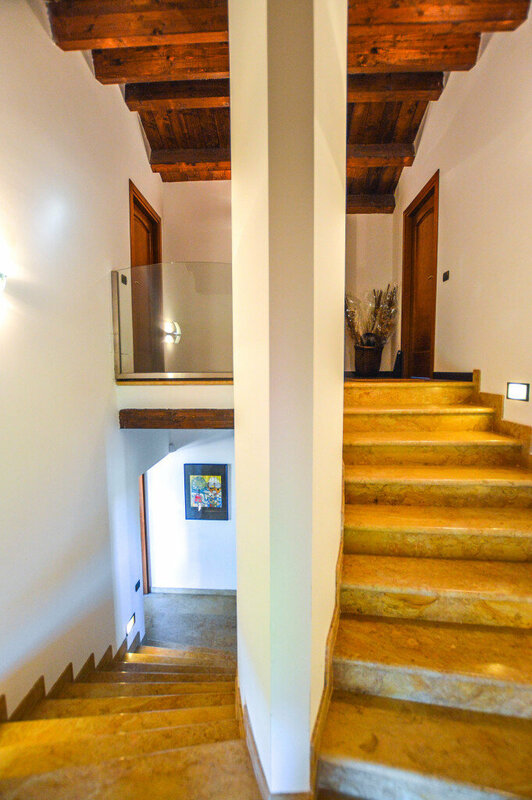 You enter the house from the main entrance and you immediately notice the distinctive tract with which the farmhouse was restored after the anti-seismic reconstruction between 2005 and 2008: large open-plan spaces were built, keeping the exterior outlines, with its original windows and doors. 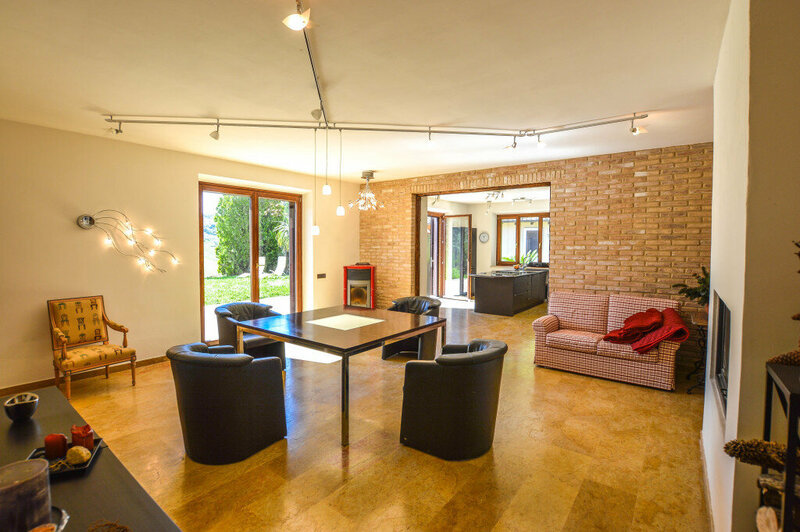 The house develops over 3 floors for a total area of approximately 466 square meters. 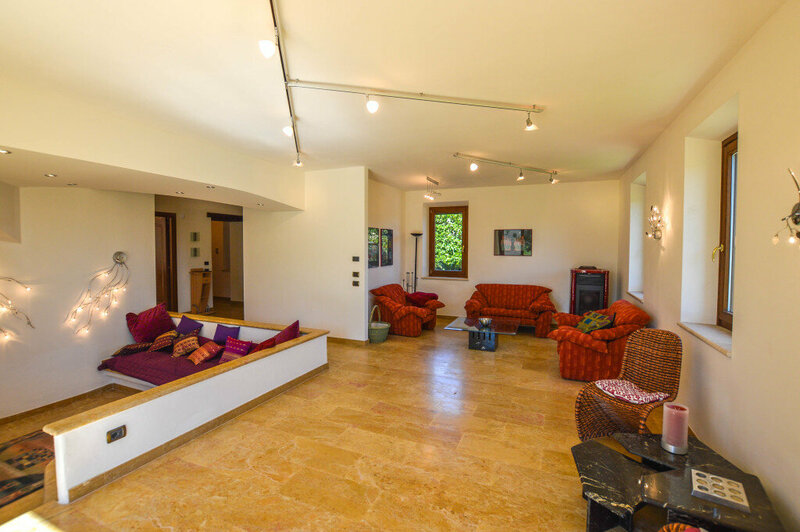 A yellow royal marble floor extends throughout the ground floor and the first floor, while the walls have been left white to give a minimal appearance to the environment, so that the furniture and the floor stand out. 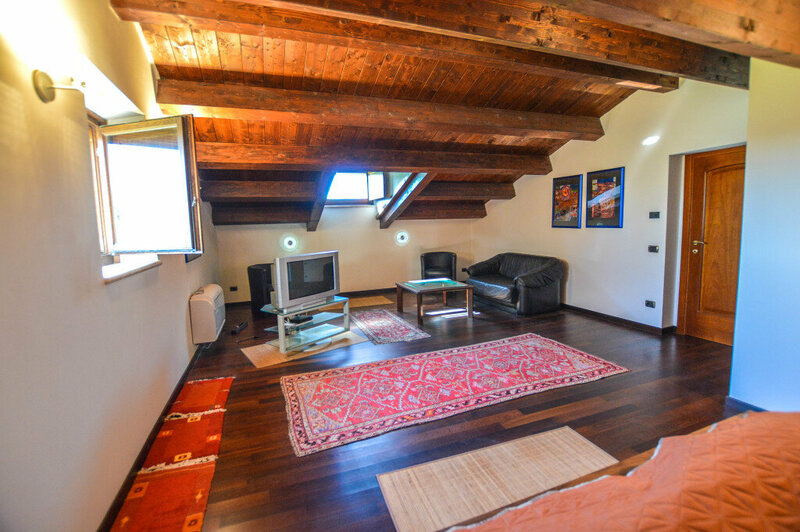 On the second floor, instead, a wood flooring has been used. 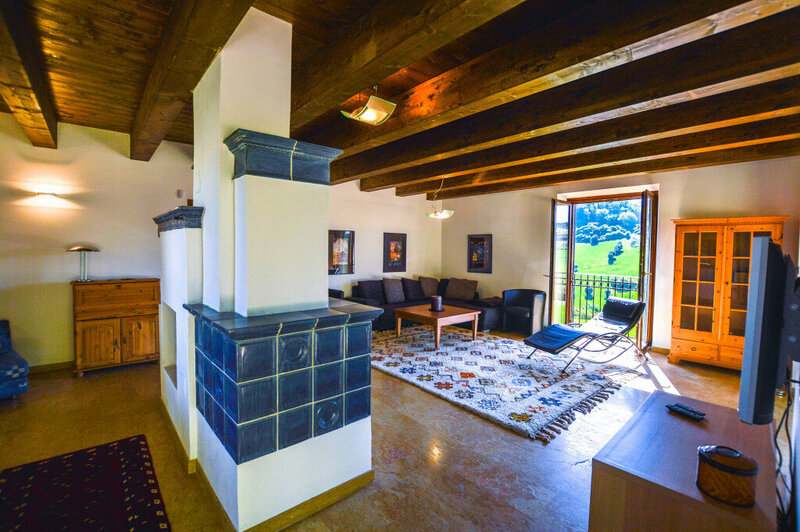 Once you pass through the main door, you enter into an entry hall room with a small room on the right, used as a wardrobe, and a bathroom for guests on the left. 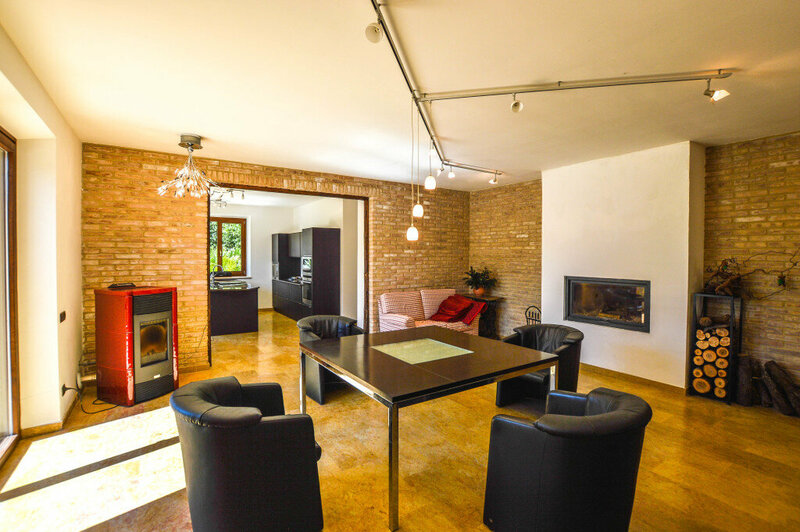 Then you enter a grand open-space living room on two levels and the lower one has a sitting area with coloured cushions and big fireplace, to create a cozy and secluded atmosphere, especially during the cold winter evenings. 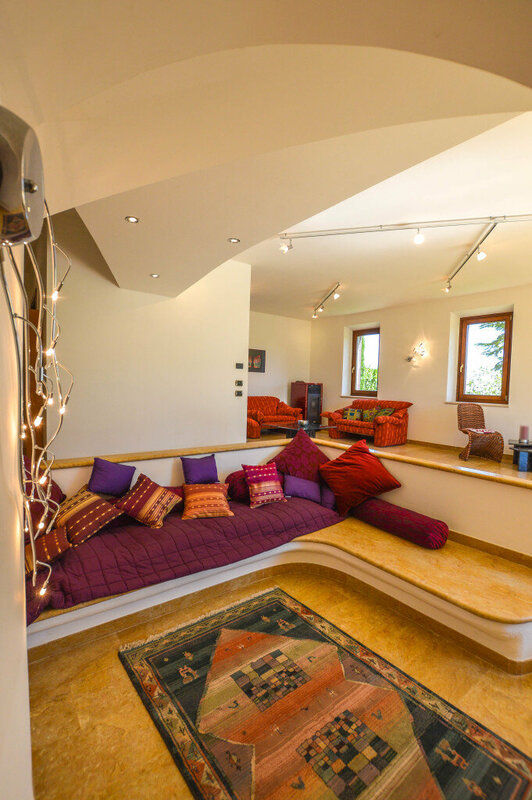 The space above enjoys a reading area and a more convivial living room. The room is very bright thanks to the double door leading to the back garden. 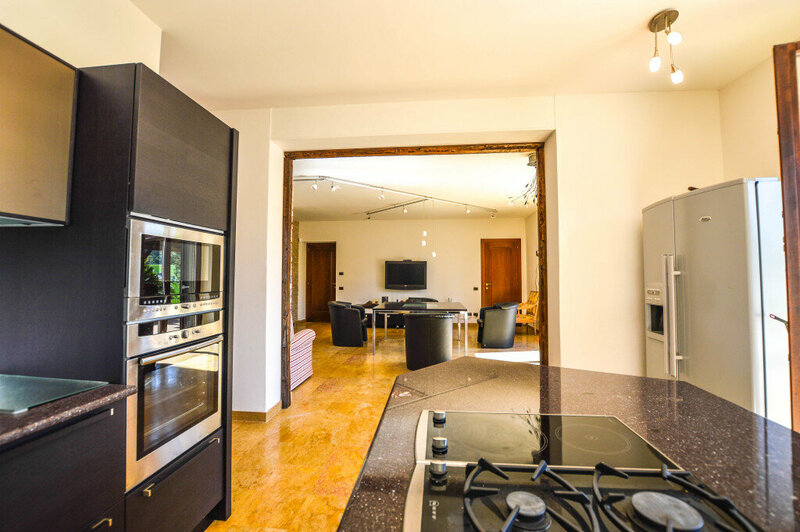 Divided by a large elliptical staircase, there are the dining room and the kitchen. 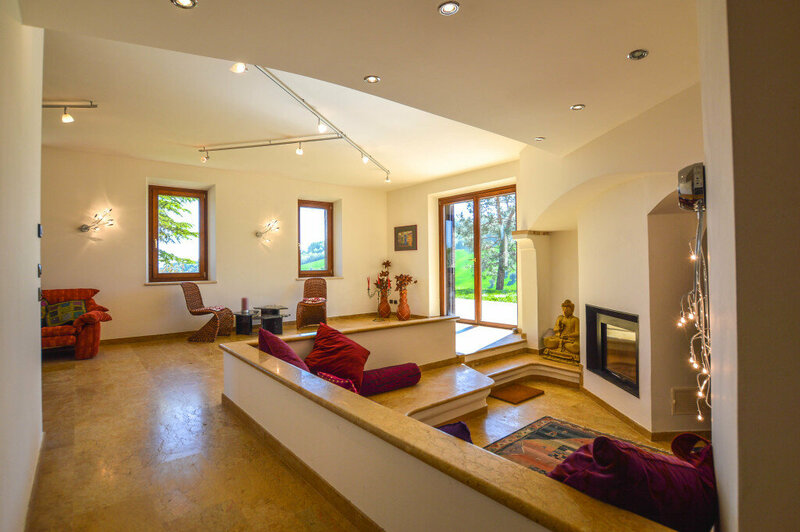 Two large rooms featuring the same yellow marble flooring, white walls and large windows opening onto the garden. The spacious dining room is equipped with a beautiful wall-mounted pellet-powered fireplace, close to the central square table, ideal for a delightful dinner with your dearest friends. 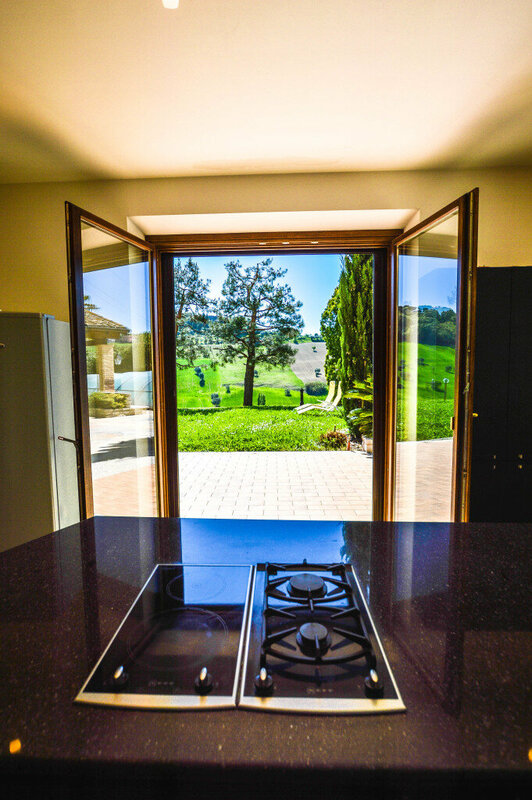 But to make it a great event you need a proper kitchen and you have it in the adjoining room. 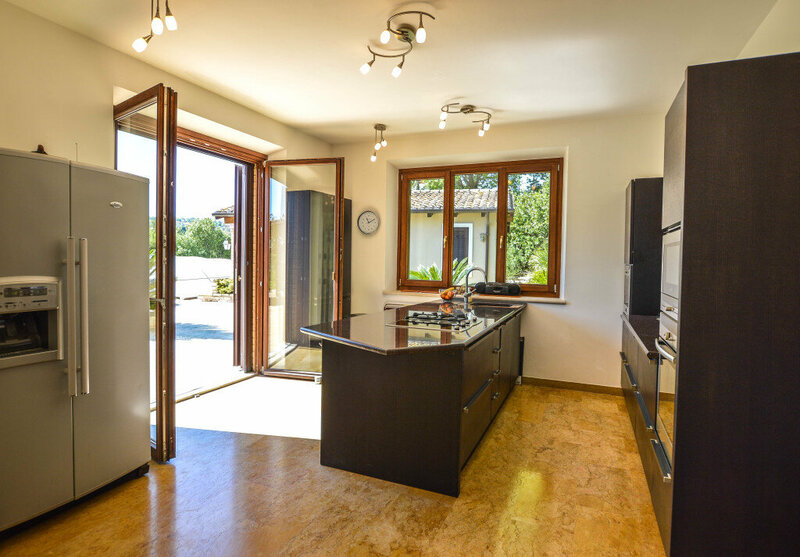 In addition to all the household appliances, to the large containment of the cupboards and to the extensive work surface, a storage space behind the kitchen columns has also been created. 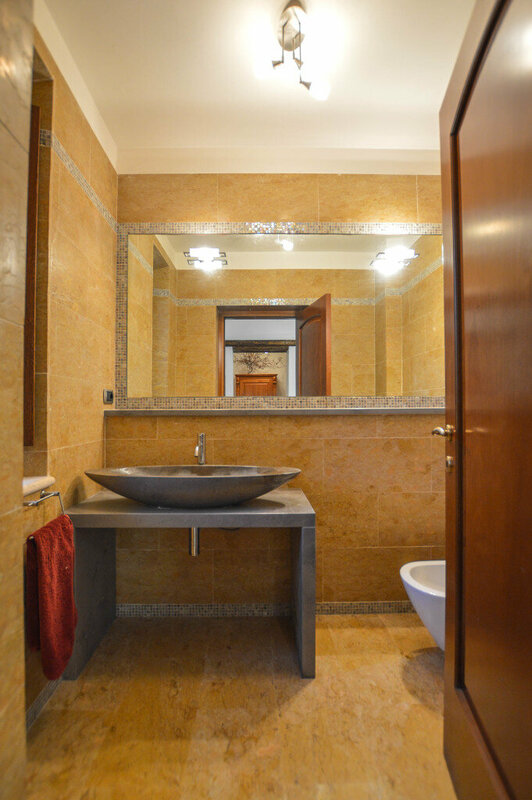 In this space you can also find another fully equipped bathroom and in front of it a laundry room with access to the thermal, electrical, and video surveillance systems. 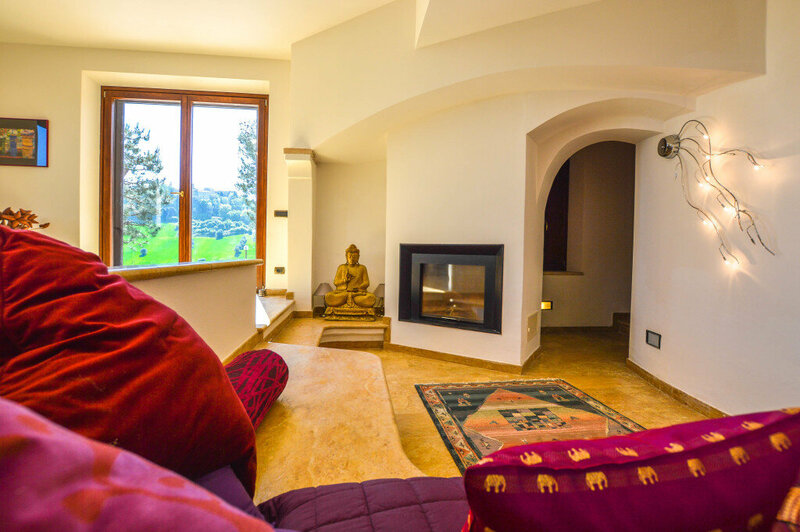 Stepping up to the first floor, on your left you can immediately notice a large two-faced fireplace positioned in the center of a huge room used by the owners as a relaxation area. 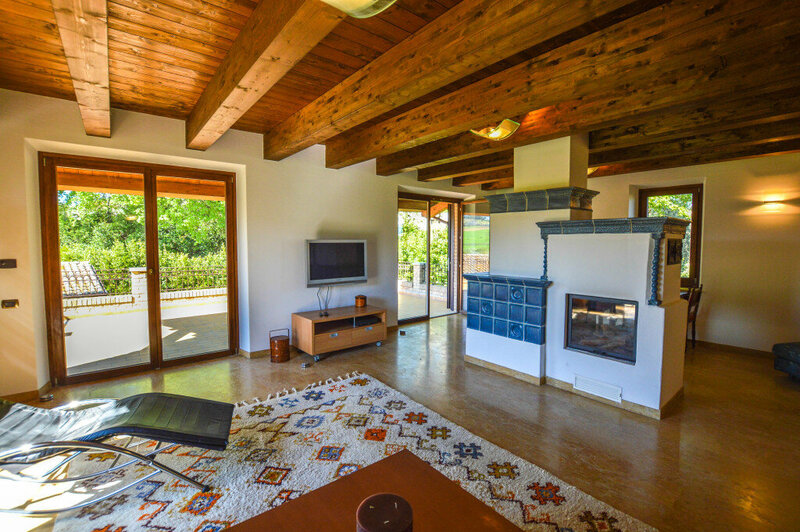 In this room, as well as in the rest of the floor, the ceilings are all in wood to further warm an already cozy setting. 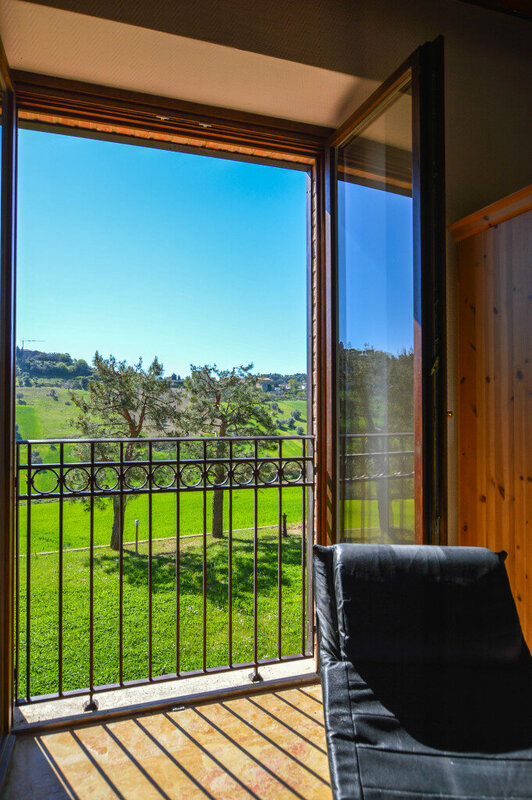 Natural light and the view of the surrounding valley are the recurring element of this room, thanks to the large windows, two of which lead externally to a terrace of about 43 square meters. 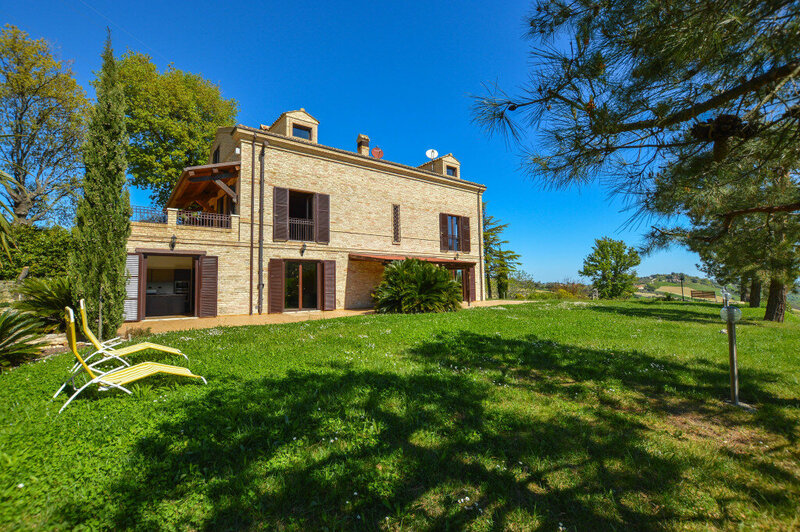 On this floor there are two more rooms, characterized by wide windows with wonderful views of the sea of Marina Palmense. One of these rooms is used as a study, while the other is currently used as a large walk-in closet, but both have such dimensions as to be converted into bedrooms if needed. 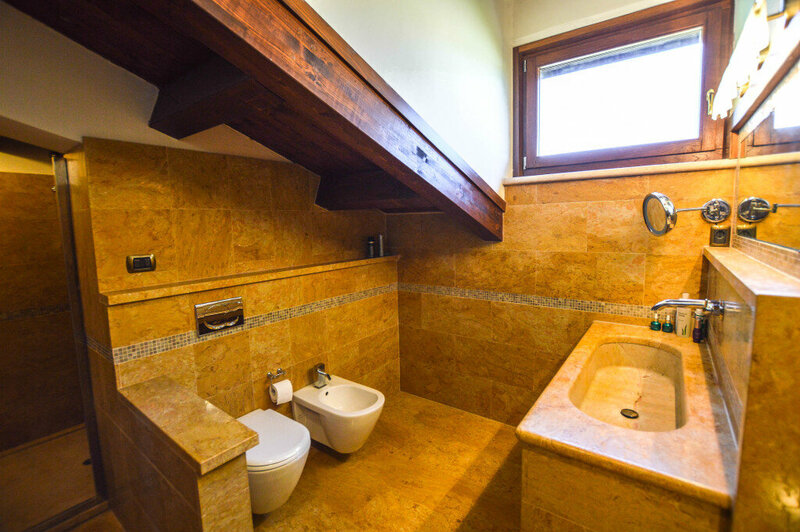 On this floor there is a fourth room where the settings have been made to create an additional bathroom. 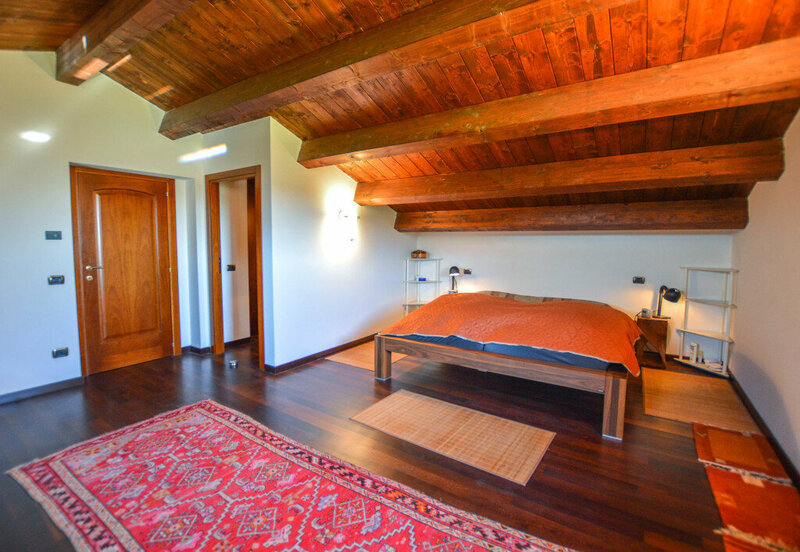 Stepping up to the second floor, we find a different flooring, made of wood, which defines and warms up the ambience of the two big double bedrooms. 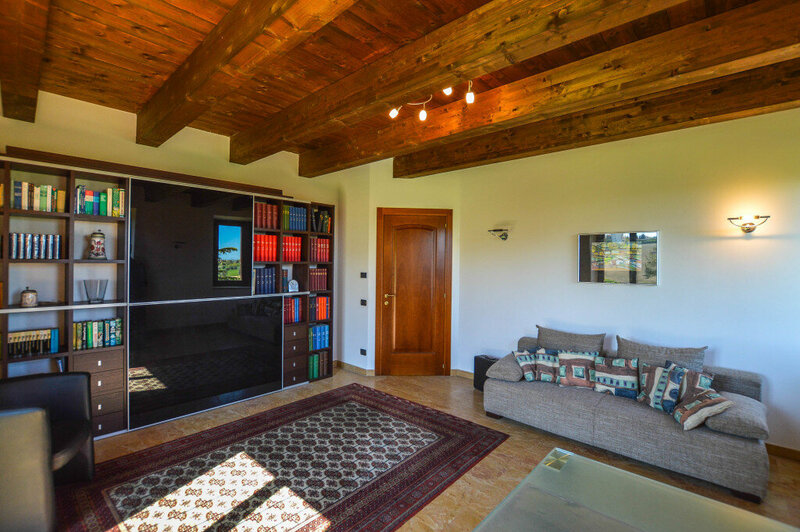 The sloping roof, fully insulated, is characterized by wooden beams and it does not disturb at all the usability of the two rooms, thanks to the height of the ceilings. In one of the two rooms a fully equipped walk-in closet has been made. 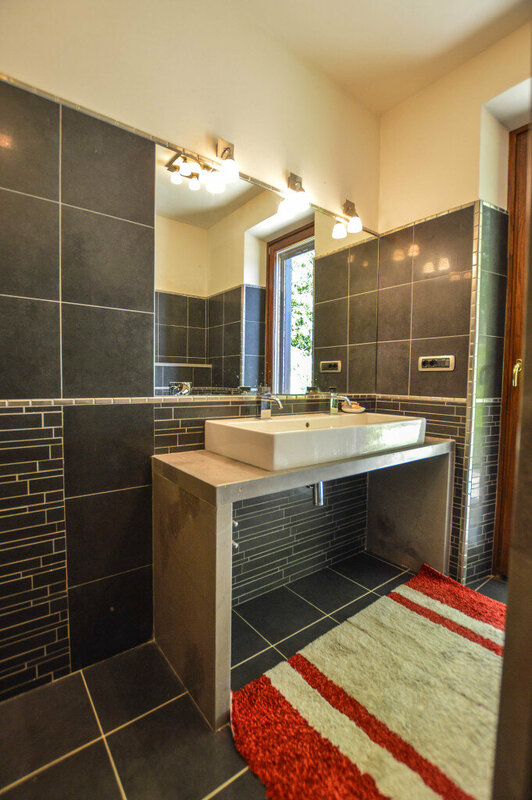 A third bathroom divides the two rooms. 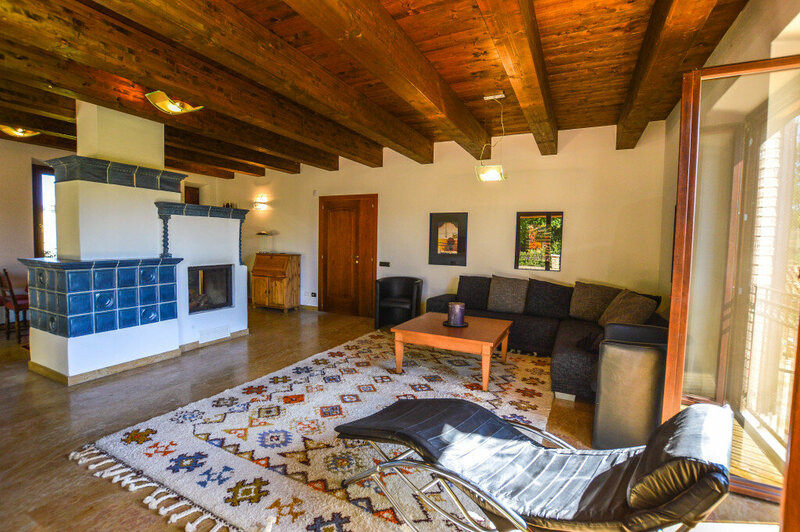 On the ground and first floors the house enjoys an underfloor heating, powered by 3 pellet stoves + 3 thermo fireplaces, while on the second floor there are heat pumps also used for air conditioning. 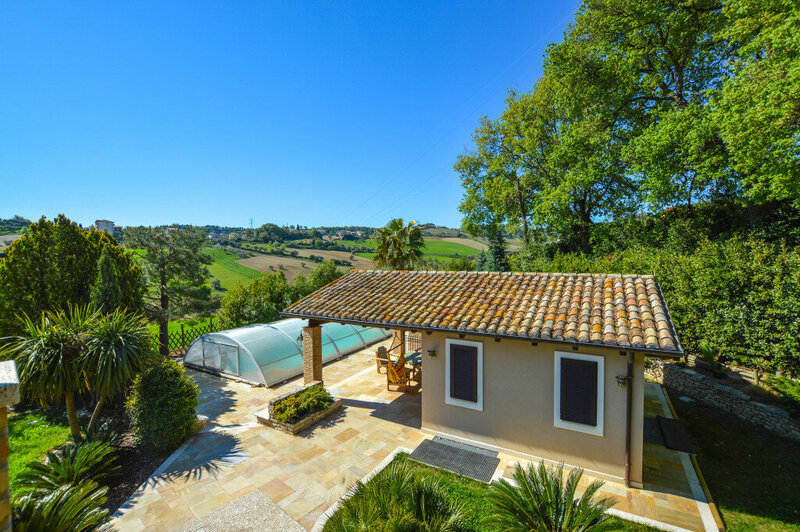 To implement the heating system, there is a solar thermal system to get hot water. 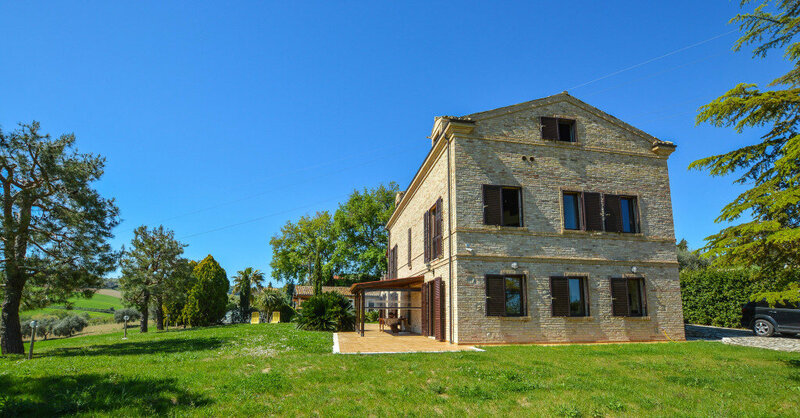 The house is connected to the mains water, but for the irrigation 2 wells (60m and 40m deep) supply water to a tank. 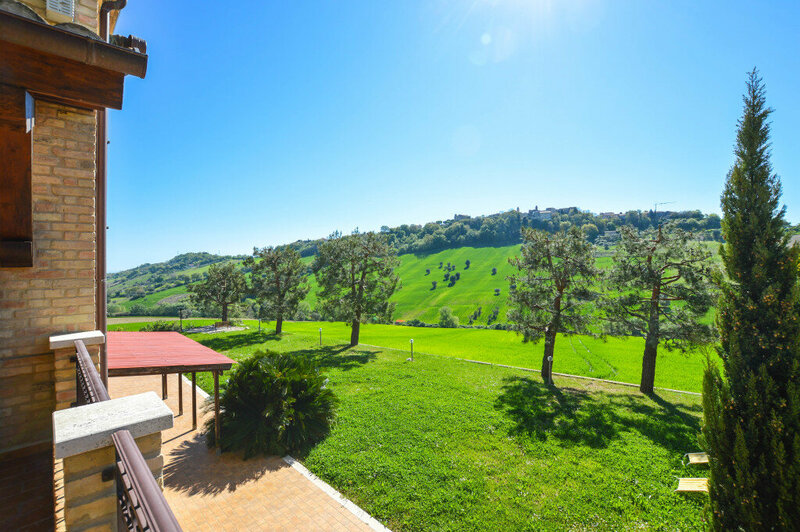 The property is almost fully fenced: the only area of the garden with no fence, is that of the main terrace, to avoid spoiling the beautiful views of the valley. 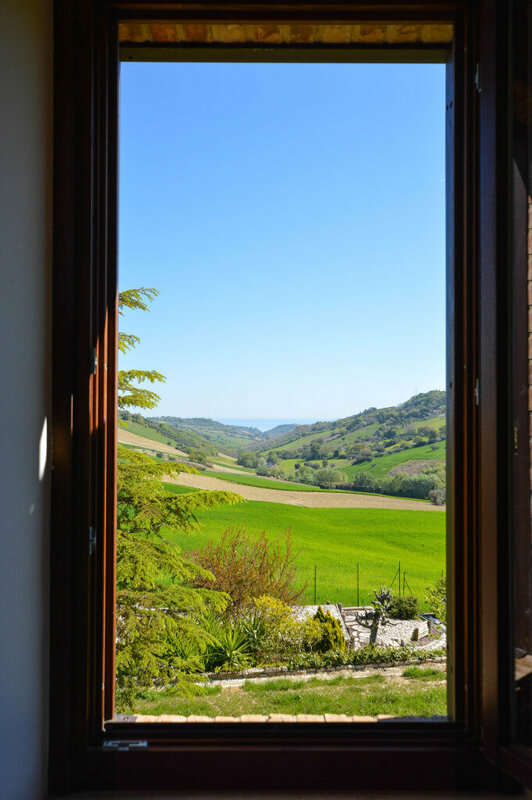 The entrance is via a gated entry with an alarm system with cameras, installed by the owners exclusively for home inspection when they are away for long periods. 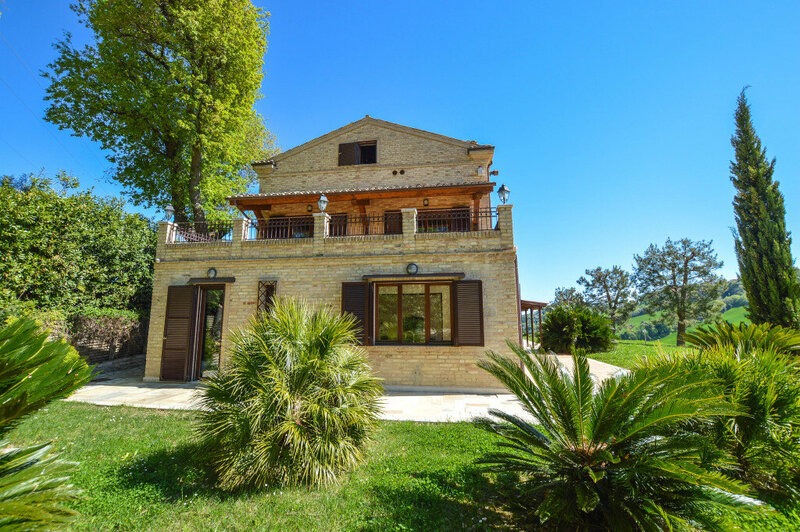 The short distance from the sea and the proximity to the old town of Lapedona make this house an ideal place for a family that is looking for privacy and tranquility without giving up on the services and without having to take hours to reach the equipped beach of the Adriatic coast of Marche. 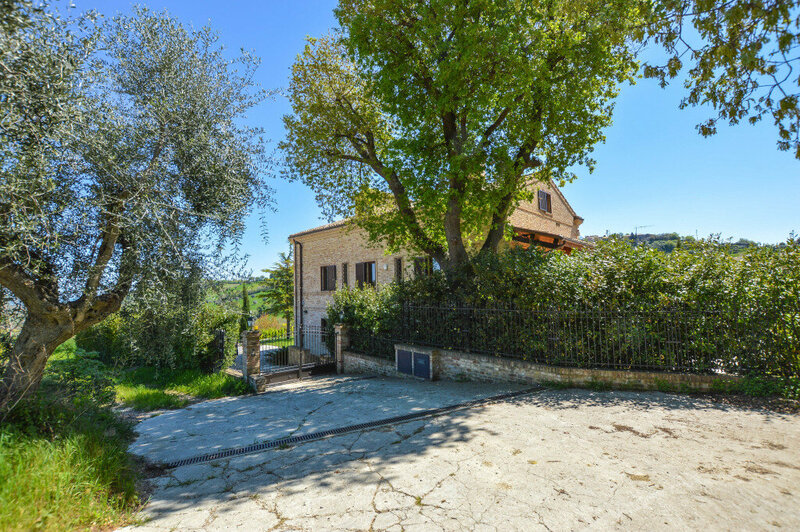 Located in the hinterland of Fermo, the property is surrounded by rolling hills mostly planted with vineyards. 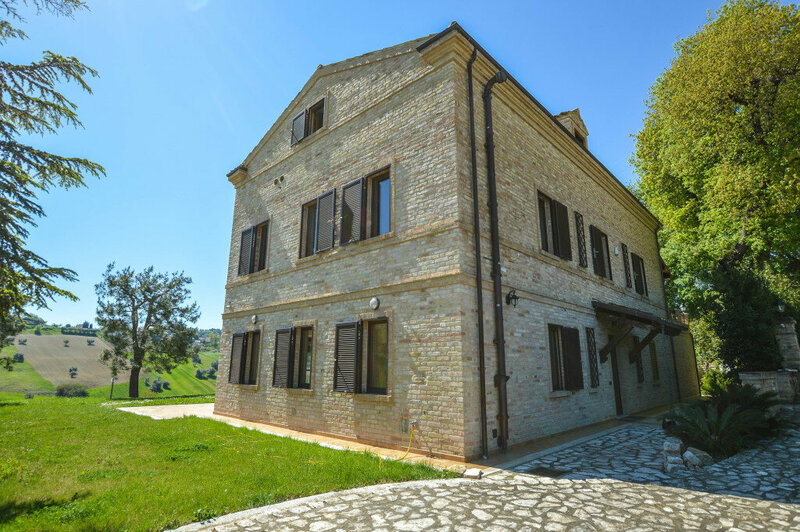 Within a few kilometers you can visit the medieval villages of Torre di Palme, Moresco and Monterubbiano, as well as the historic center of Fermo, just 8 km away. 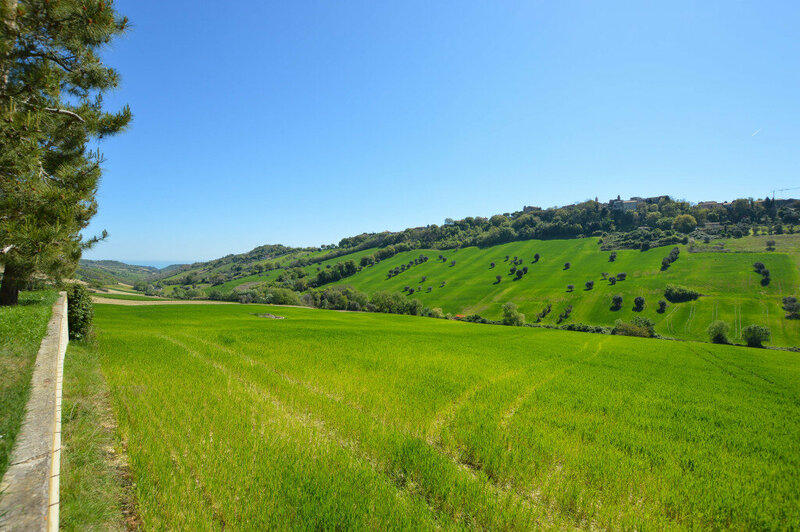 Reaching all the other areas of region Marche is very easy, as the A14 motorway is 12 km away and reaching the Ancona airport takes approximately 55 minutes. 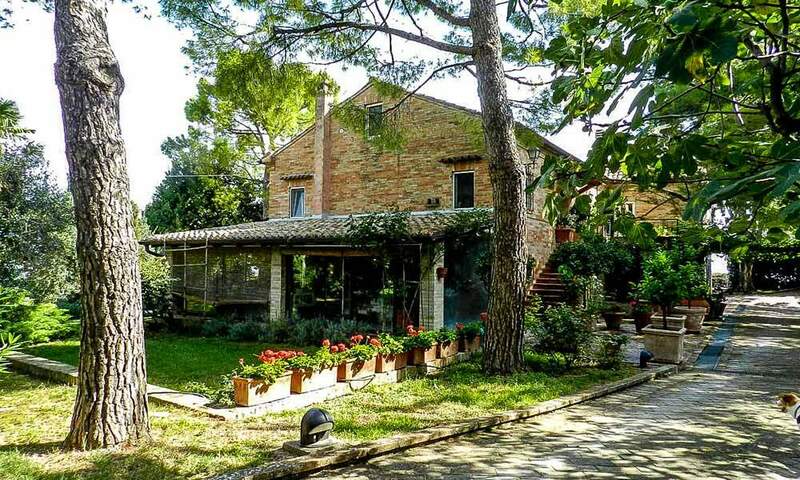 LAND / GARDEN: 2.400 sq.m.